A humorous garden pig statue which will not easily fly away. The creation of the verbage "flying pig" is associated with something that can never happen and is far-fetched. 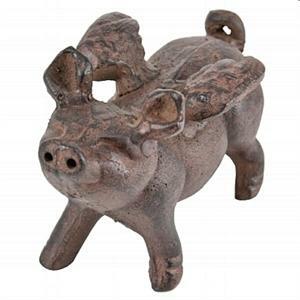 While the term rings a note of humor with this statue, this cast iron pig statue will make a fine pig gift idea. Created for outdoor use. One of our whimsical pig gifts including this cast iron pig statue with a hopeless plan to fly but never quite making it there! Cast iron.